Thirsty Pilgrim: Thirsty Pilgrims Move On. That's Why We're Called Pilgrims. Thirsty Pilgrims Move On. That's Why We're Called Pilgrims. Announcing the important announcement of an announcement... No, I'll just come out and say it: We're leaving Belgium soon. We're moving to Costa Rica in about a month. But this blog will keep on chugging. I don't need to explain the challenges inherent in moving a beer blog's base of operations away from beer paradise and into a beer wasteland (even if that wasteland is, more or less, an actual paradise). Nor the problem that I've apparently become a beer writer. My next book: Around Costa Rica in 80 Bananas. Ho ho. Here's the thing about the blog: If I'm right, it won't change all that much. It will still be about drink and food and travel, with an emphasis on craft beer. The photos will be sunnier. Until now the blog's spotlight has been pretty narrowly focused on Belgium, mainly because it's where I've lived and there's more to write about here than any one blog can handle. Initially I'd intended to cast the net much wider. Now I'll have another chance to do that. What you can expect: More useful information and news for thirsty and hungry travelers worldwide, including Europe and North America. I'll keep covering Belgium, to a degree, because despite my cynicism I still think this country makes the best beers on Earth. Meanwhile I'll have a unique chance to cover the Latin American craft beer scene... Imagine going back in time and being able to write about the handful of 1970s and early '80s American microbreweries, knowing what we know now. A scene like that can use honest writers, I think, to help keep it healthy. I'll also be writing more about homebrewing, and what it's like to brew in a place like Central America. Because partly out of sheer need I'll be doing a lot of it. That's the plan anyway. It will change. It always does. Meanwhile I still have plenty of Belgitude to empty from my notebooks. Stay tuned. In the somewhat crappy five-year-old photo: The hot-spring-fed swimming pool at Tabacón Resport, near the base of the Arenal Volcano in northern Costa Rica. From our honeymoon. Going down the water slide and swimming across to the bar in one smooth motion fulfilled a life goal. Never mind what we drank. In the future, all bars will be swim-up bars. I discovered this blog a few months ago, and this is in my opnion one of the best beer blogs in the internet. Well writen and with no comercial backgorund. Maybe the things aren´t so different in Costa Rica. Homebrewing is the solution and that is what I do! 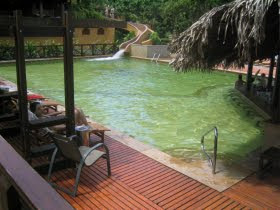 If you are planning a trip to Brazil, let me know and I can advise you some places to visit and some beers to drink! Ah, "belgitude". What a lovely Jacques Brel sort of word. Mind you, given the weather in this bit of the world over the past few months, Costa Rica sounds mightily tempting, beer or no beer. Good luck with the move, Joe. And I hope you have plenty of sources on the Belgian beer scene to keep you, and therefore us, well-informed of happenings. Joe, good luck with the change of scenery, I hope you remain a member of the Guild, you will be our second one out in South America. 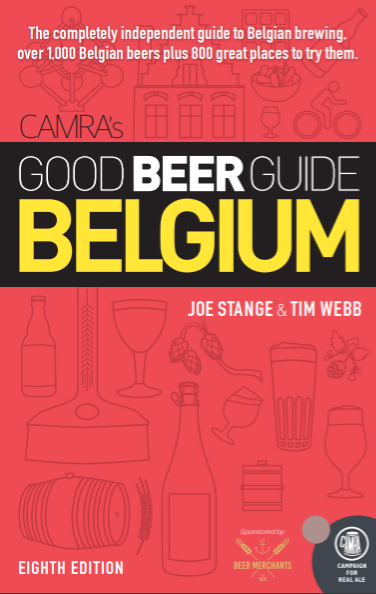 And who's going to keep us updated on everything there is to know about belgian beery news now ;)? Seriously, you were always the first to know about everything going on in this country! If I hadn't stumbled into your great blog I'd probably never have started Malt In Pot... Thanks for all that, and we'll keep on reading you anyway ;)! Good luck with the move! PS : Too bad we never even had the opportunity to share a beer at Moeder Lambic! Felipe: Thanks for the warm welcome. Brazil's scene is light years ahead of Costa Rica. I'll explain very soon. Des: I should have known that word would draw out the chanteur. Toine: It's not too late. I'm here for a few weeks yet. There is no beer scene in Costa Rica. You have your choice of Imperial, Imperial Light, Bavaria Light, Gold and Dark and Pilsen. Oh and Rock Ice I guess too. All made by the same brewery. Most of which are refreshing in the hot weather but lacking any complexity. If you are lucky you can sometimes find some Guinness export or Hoegaarden Forbidden Fruit. Well, "pura vida" sounds like the best saying for the adventure. A pity we didn't met in November. Moving to Costa Rica?!?! there's something you dont hear often. Good luck, fella. I wish you the best and be sure that I'll keep reading. I've always wanted to know more about rum.